Many times Monsun owners have come to the point to need to clean the dieseltank, that is normally unaccessable. Here it is shown how this may be done, together with some improvements to the system. Have the tank filled at least 3/4 when it is cold in the surrounding water and/or air. Do not buy your diesel from a car filling station, since the biofuel added in that diesel fuel causes troubles. Add a diesel biocide to the tank contents, especially during long times of not using fuel (winter). Have a double filter between tank and engine, one coarse and one fine. This has saved me from many problems. Make sure you empty out the bottom sump at least once a year through the bottom-placed extraction tube that is installed. See to it that you have clean diesel fuel and keep water from entering the tank. Now from the German site: During the winter 2010/2011 they sent the engine for a complete overhaul. After lifting out the engine, the engine compartment was completely emptied and then renovated. They renewed all acoustic insulation and cleaned and treated all surfaces, and even the keel tank was cleaned. The completely renovated engine compartment. 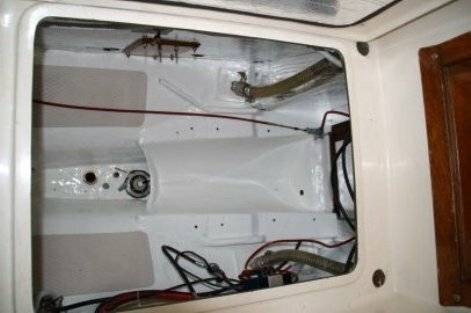 The keel tank is under the engine compartment and consists completely of GRP. 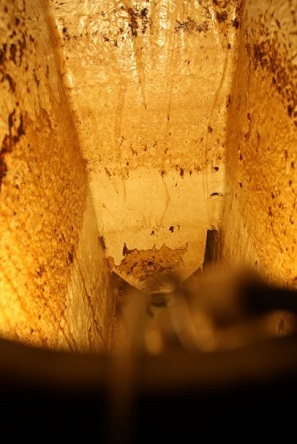 Two vertical squall plates divide the tank into three chambers. 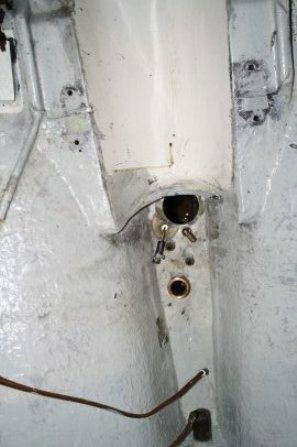 In the rear narrow chamber are the refueling connecting piece as well as the connections with the fuel line to the engine and ventillation hole. The front tank compartment has a 1-inch threaded ventilation valve, which is closed with a cap at the side. Except for this ventilation valve and the fueling line hole there are no original entrances into the tank. First remove the diesel fuel up to a remainder of approximately 10 litres, using a fuel pump connected to the extraction tube or a tube in the filler hole. 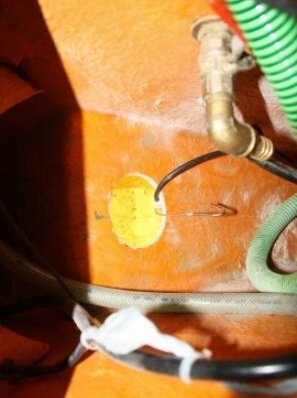 Then with a 90-mm hole drillbit drill two access holes, the first directly behind the engine fuel tube and the other at the side of the cabin. (keeping a bit away from the 1-inch ventilation tube). Now the actual work began: With a pot sponge, toilet brush, a large quantity of rags and other home-made cleaning equipments the cleaning was accomplished. As cleaning agent I used a mixture of diesel and gasoline. In very laborious work I needed about 6 h to get rid of the largest part of the persistent, brown, sticky mass. The tank bottom can only be cleaned by hand if one has very thin and long arms. Otherwise, you need home-made tools. The middle tank, which is separated by the two squall plates, I could bend a device around and over the edges of the plates - And with a lot of difficulty clean out this one as well. Isabell has a very clever tank level measuring device, which I will describe elsewhere on this website. After the manual coarse cleaning, the dark-brown sticky mess from the bottom was scraped out and washed off with petrol gasoline, using a pressure fuel pump and hoses connected to a 20 liter carboy can. Into the hole behind the engine tube I built an electronic tank gauge device with 600 mm length. The tank stick measure ends exactly like the diesel feeding line to about 10 cm over the tank bottom. 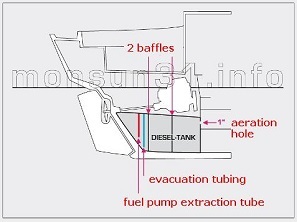 The overview of the dieseltank underneath the engine compartment copied from monsun31.info website in German.